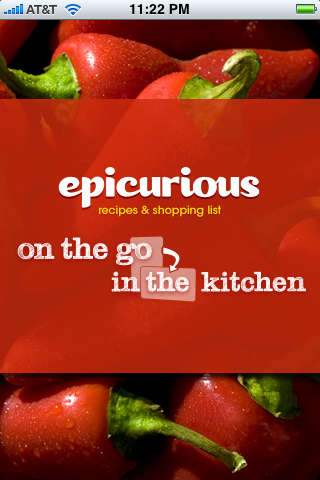 Epicurious has released an iPhone app today. And from first looks its pretty good. The other recipe app that I have on my phone is BigOven. Epicurious does look and feel nicer. I like how all the recipes are categorized into easy to find tabs. I can easily find recipes that I can cook by looking under “I can barely cook”. A nice feature is that you can add a recipe to a shopping list, which then allows you to create a list of ingredients that you will need to buy during your next shopping list. Another cool thing about this app is that its the first one that I have seen ads that have been integrated into the software. The ads are unobtrusive and are typically shown while the recipe is being downloaded. 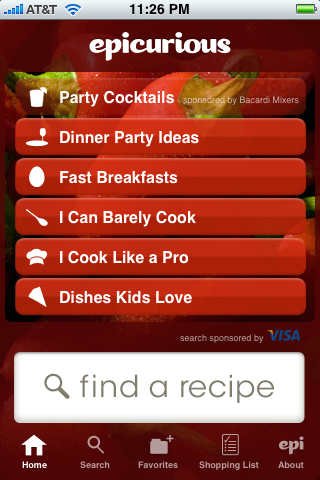 With 25000 recipes, this is probably going to be the go to app for recipes for our family. I do the work for free…. What Microsoft Live Maps is missing?